It’s Spring in Australia, and the purple haze of jacarandas in full bloom is visible all over Brisbane. Here, the flowering jacarandas are a signal to university students that it’s exam time…and one of the best displays of these beautiful trees can be found at the University of Queensland, a sight that gladdens my heart as I walk there each week. Jacarandas are native to Brazil, but they grow well in many of Australia’s warmer parts and are spectacular in Brisbane. Take a CityCat ride along the river to see the colour along the riverbanks, and get off to wander in New Farm Park, where they are in their full glory. Brisbane folk love them, and many gardens are carpeted with the fallen blooms right now. 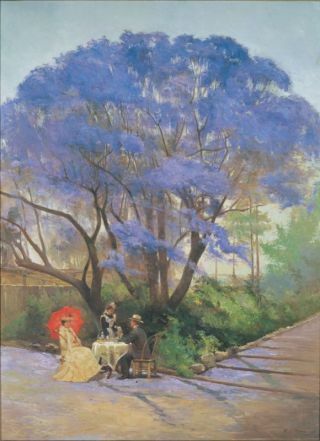 It is hardly surprising that Under the jacaranda has been one of the best loved works in the Queensland Art Gallery’s collection since it was bought in 1903. It’s a wonderful, romantic picture showing the artist, Godfrey Rivers, and his wife Selina taking tea in the shade of a jacaranda tree in full bloom. Rivers completed the large oil painting 13 years after he arrived in Australia from England. The tree was a landmark in Brisbane’s Botanic Gardens, which adjoined the grounds of the Brisbane Technical College (now Queensland University of Technology or QUT), where Rivers was an art teacher from 1891 to 1915. According to the gallery, this was “almost certainly” the first jacaranda to be grown in Australia and was planted by the gardens’ supervisor, Walter Hill, in 1864. It was blown over during a cyclone in 1979 and part of the trunk is now held in the offices of the Mt Coot-tha Botanic Gardens. Under the jacaranda hangs in the Australian Heritage Collection in the QAG. Go along for a look and you’re likely to find several people transfixed by it – at any time of year. And if you really like it a lot, you can buy prints of it at the gallery shop. Colourful factual story. I heard that the movie ‘The Colour Purple’ was made under a jacaranda tree in New Farm Park. Can you please advise me on that. I think it’s time you rented the DVD and watched it again, Tommy. But life is full of surprises…Oprah loves Australia, as you know, and I’m sure that she and Whoopi would have been here like a shot if they had a chance.